a star for your tongue? Posted on November 25, 2011, in Friday's Fences, haiku, Haiku My Heart, Himmelsk, One Single Impression, Sky Watch Friday, Southern California. Bookmark the permalink. 20 Comments. This haiku takes me right back to my childhood… I can almost smell the big, warm cows that came to the fence… thank you for a lovely memory! this photo is like one of mine too… here outside my window, as I have now moved to the wild and wooly country!! ~star for my tongue~ great line! That haiku is so evocative! I also love the image of a star for my tongue! and a joy for my eyes. Beautiful..one starts thinking..and wondering.. good one…MMT..
Great shot, I was waiting for the cattle to come over the hill. Love your words too. I love all the fences you post, but when I thought of star in my tongue, I said ouch. Just a gut reaction. Love your photo and words. I guess that’s the perspective a child might have! Nice clear blue skies! Thanks for your lovely comments at mine! Blue sky looks soothing with that brightness on the horizon. Love the view through the fence. I think I sense cows nearby. Thanks for your thoughts and concerns for me the past few weeks. Things are getting better, on the Creator’s time schedule. I appreciate your friendship. Grass look greener on the other side and it is but natural to seek it!! Ouch the stars are spiky!! Love the haiku and the shot is amazing. I like the contrast in colors beyond the fence. 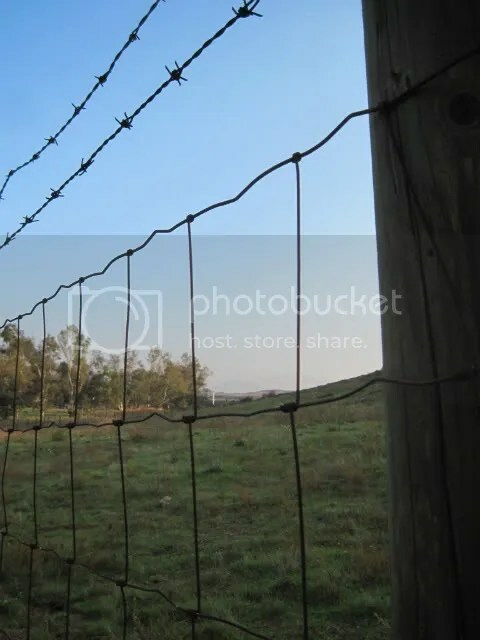 This is a great shot, beautiful in all it’s simplicity, barbed wire and all!